The Bear & Son butterfly knife has a 440 stainless steel clip point blade that has a keen edge capable of serious damage. 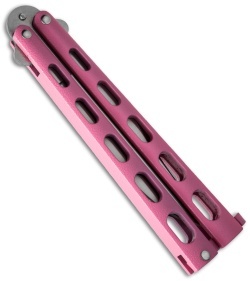 The skeletonized handles are made of zinc with that bright pink powder coating on them. Don't let the color fool you - this knife is crazy sharp and flips like a gymnast. It's lightweight and fun to flip (we recommend some training videos and maybe taping the edge of the blade before diving into this). It includes a tail lock for holding the knife open (in case you want to use it for opening boxes or something practical like that), and to lock it closed so there isn't any accidental slicing when you don't want it. This knife is okay. but wish I bought one with a metal handle. 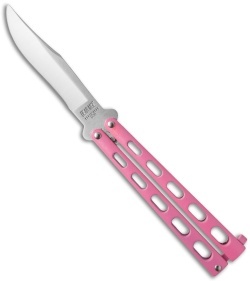 I had a butterfly knife when I was 12, Loved it. finally decided to buy another one now I am in my 30's and placed the order for this knife. it came in the mail fairly quickly and And after 4 days of owning it, the zinc handle kind of chipped around where the little stopper on the blade is in between both handles. I would get a metal handled one and not a zinc handled. I feel like this knife will break soon and I will have to buy another. Its great for the price however like most cheaper bali's the latch will not stay close. flips pretty smoothly. Dull out of box but quick to sharpen. 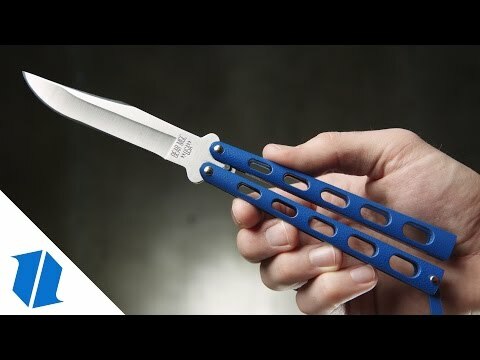 Great Knife! Bought it as my girlfriends first balisong and it looks and feels amazing. Definitely worth the price! The zinc handles are very smooth. The only complaint I have is that the box it came in was in bad shape. I collect knives so I like to have the box looking good, but this box was dented and it looked opened. She didn't mind too much since she threw the box away but I would be cautious if you are a collector.